It felt as though my cheeks were rippling just like those of a sky diver. I was clinging on to the trig point jaws clenched to avoid being blown off in the direction of Loch Choire. The bitter wind sliced through the layers I had on. It was difficult, if not impossible, to hold the camera steady. 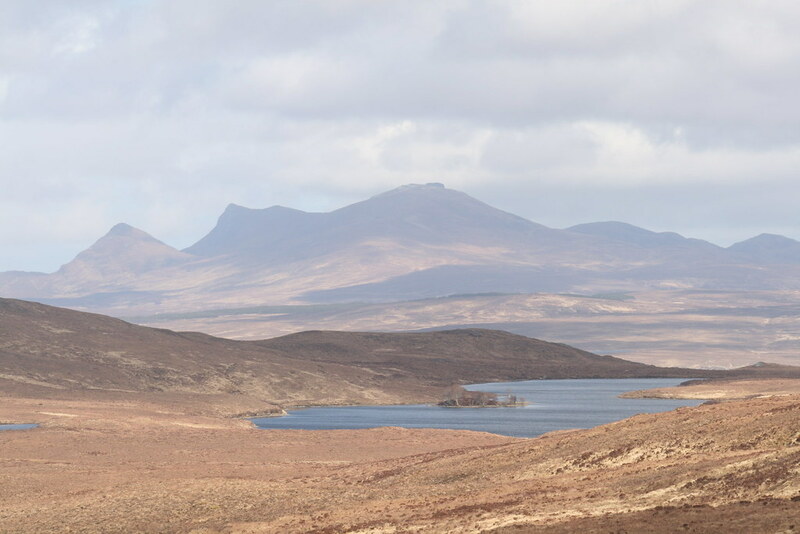 That was a shame because the air was clear and there were good panoramic views to Ben Loyal, Ben Hope, Ben Hee, Ben More Assynt and Conival and to the lower ground to the east and to distant An Teallach and Beinn Dearg. 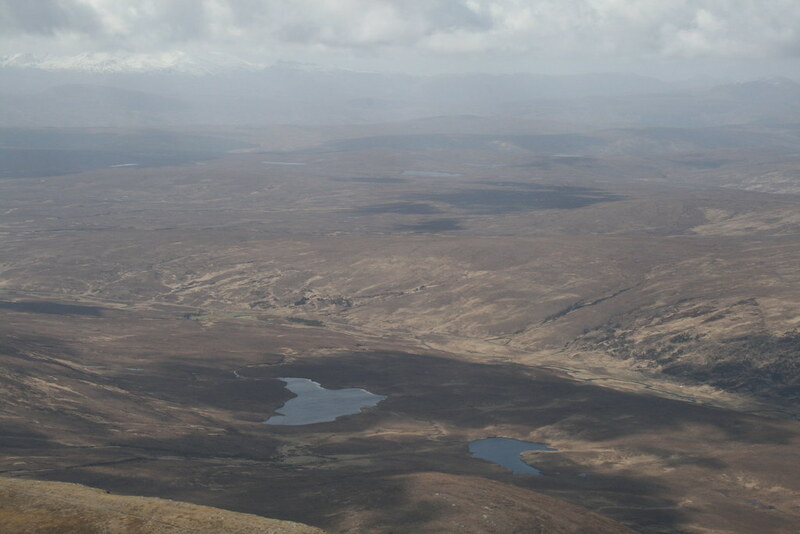 The 60% MWIS chance of cloud free Munros that had been forecast was laughable but the forecast wind was about right. White puffy clouds scuttled across the sky and the tops were all clear with visibility spoiled only by the grey curtain of the occasional far off shower. Anyway I managed to get a few shots off. 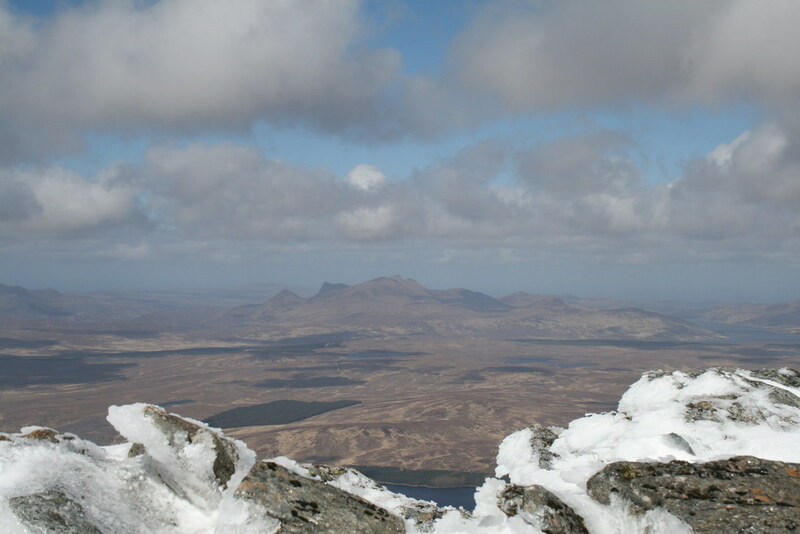 I then scuttled down to my rucksack that I had left just below on the east side of the short summit ridge, ground that I had shortly before staggered up like a Saturday night drunk. 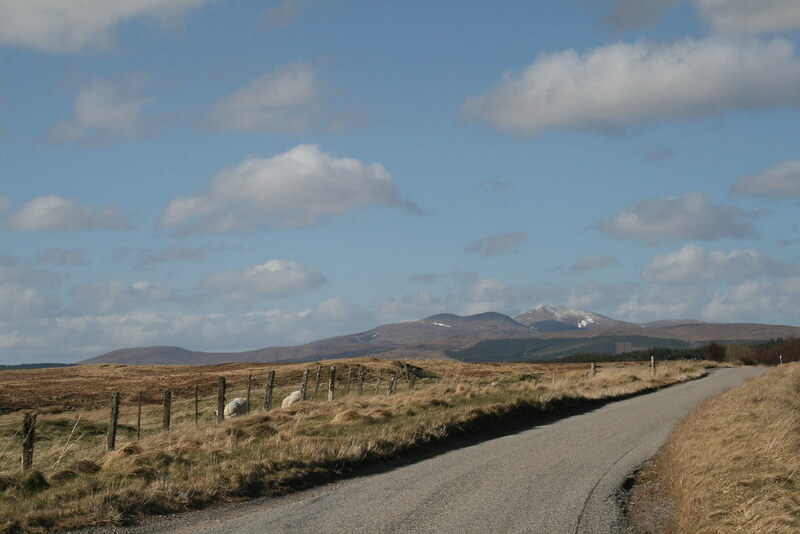 I stuffed a bit of food in my mouth looking across to the Caithness hills. But unfortunately it was not a place to stay long. The lee of the hill had an equally chill (if slightly less strong) wind vortexing back up the slope flinging spindrift in my face. So I readied myself for the descent. Just getting back up the 10 metres or so over the ridge and on to the western slopes of the summit cone took a lot of effort. Leaning into the roaring wind, it felt like pushing at a heavy oak gate. Once over the top some nice snow allowed me to run down much of the 200m to the line of rocks that marks the foot of the final ascent. There is a zig zaggy path above those rocks that eases (and speeds) you up that final ascent, though today the upper reaches were hidden by the snow. Some large snow patches amongst those rocks provided an excuse for further childish leaping. 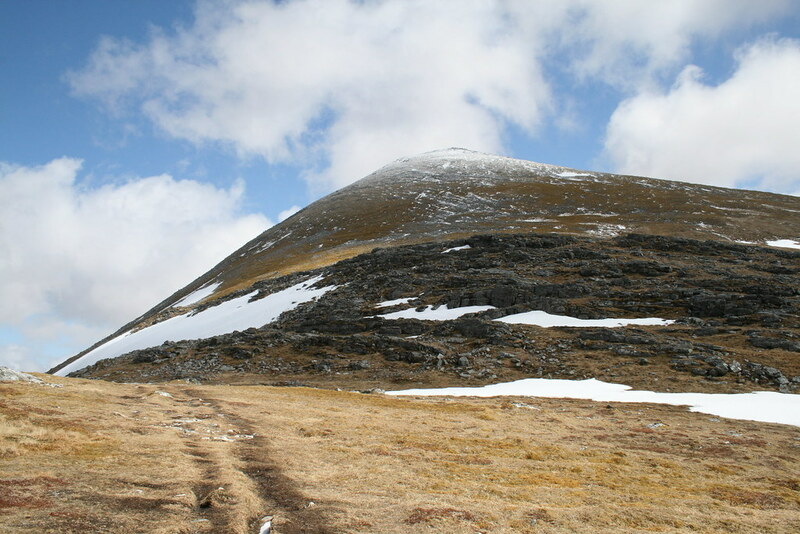 Here the path along the ridge runs in the lee of A’Choich. The wind suddenly died and warmth could be felt from the sun. 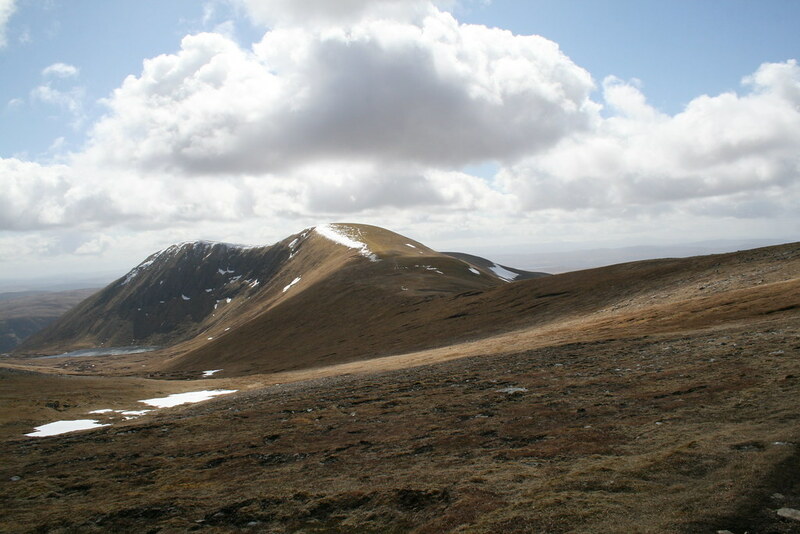 The humped back ridge continues southwards over Creag an Lochain and then west to distant Cnoc Sgriodain, though the path does its best to outflank an unnecessary ascent. Down at the bealach at point 688 though I did not follow the ridge. Instead I slanted down in a south westerly direction following a convenient deer track that conveniently avoided some slimy craglets that I had managed to get myself tangled up in on the ascent. 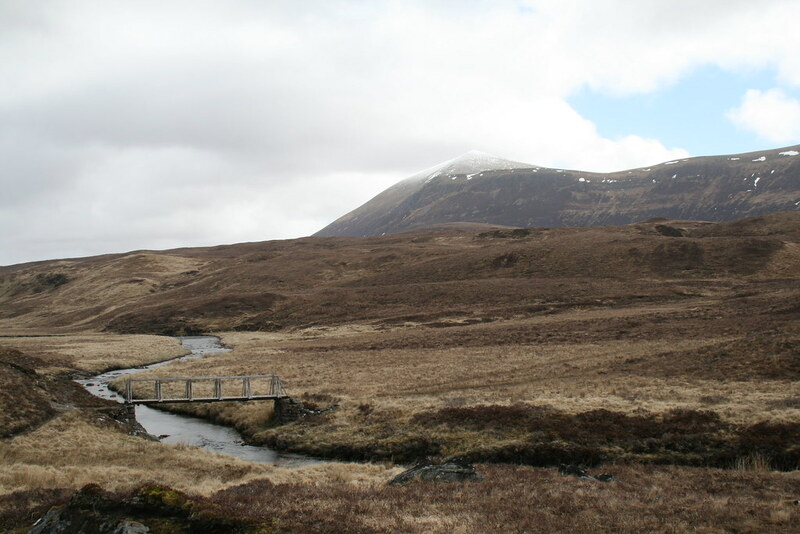 When that track disappeared, it was not a problem because the ground improved and, although the slope was still steep, I went straight down aiming at a point a couple of hundred metres to the south of Loch nan Eun. 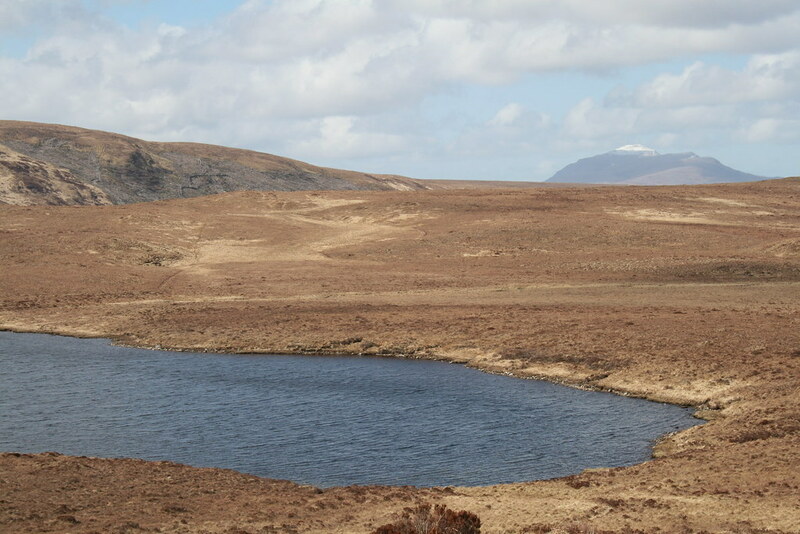 I could see a white rowing boat tethered to the shore at the far end near the outlet to the Loch. Fishing would have been a little choppy today. I had a bird’s eye view of my route back to the car over the 3 kilometres of bog. It was straightforward enough, wet but not desperate. Both Loch nan Eun and Loch Bad an Loch were very blue with small waves being driven by the wind. 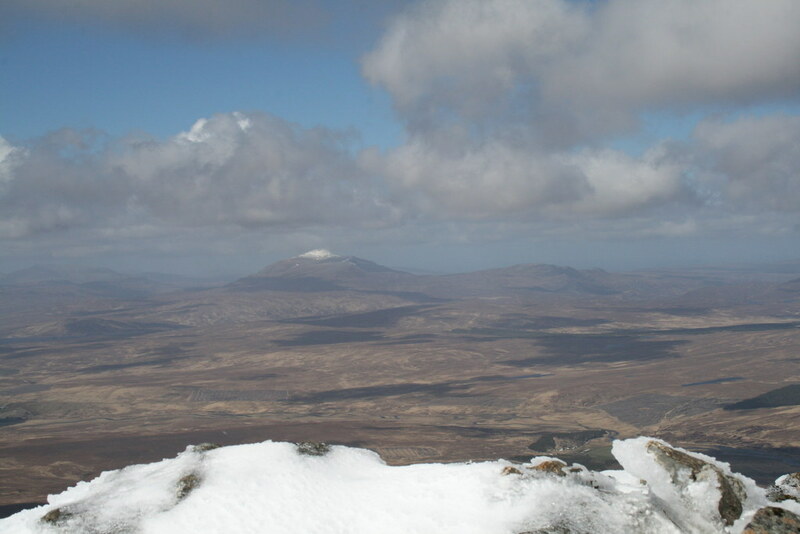 Ben Loyal provided the backdrop looking north. 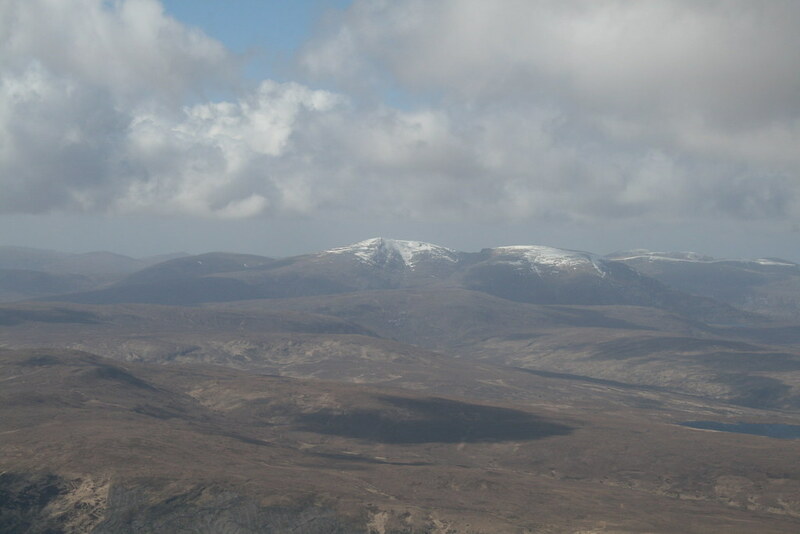 Ben Hee looked close by and Ben Hope had a little, not much, snow. I crossed the exit stream at Loch Bad an Loch right by the Loch itself hopping on some conveniently placed rocks. I cut out the loop of the stream which I then picked up again and followed. A wet path appears on the left bank of that stream where a fence crosses it. The path leads in short order to a bridge over the River Vagastie at point NC 537288 (a little to the north of the cottage of Vagastie) where the car was parked. A straightforward five hour round trip including 25 minutes of stops. PS the night before I climbed Ben Klibreck I stayed in the delightfully idiosynchratic Crask Inn. There is not a huge amount of accommodation choice in this part of the far north of Scotland but the Crask Inn is well worth a visit.